Guava is one of the richest sources of dietary fiber. Besides immunity, guava do wonders to skin and also promotes fertility. Guava also helps in regulating metabolism which leads to weight loss. Have not all of us enjoyed a plateful of guavas sprinkled with chaat masala atop? Nothing else can match up to the luscious jams, jellies and murabbas laced withan intoxicating strong-sweet fragrance. Undeniably, it is one fruit which always got enough lauding from our grandmothers. Guava, known as amrood in Hindi, comes loaded with tiny hard seeds at the center. It is believed to have its genesis in Central America where it is alternatively known as "sand plum". It is round or oval in shape with light green or light yellow skin, and the colour of its flesh varies from white or pink to dark red and has edible seeds. 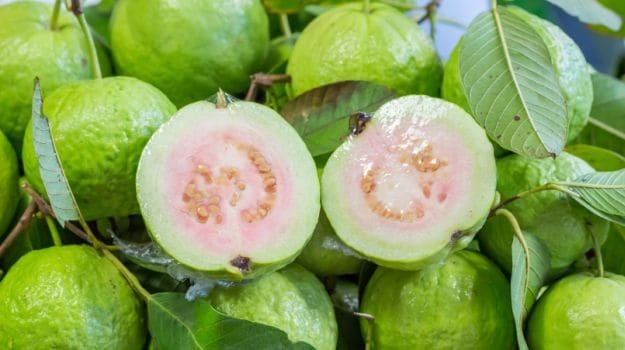 Besides its unique flavour and fragrance, guava has been hailed as one of the super fruits due to the numerous health benefits it offers. It indeed is a powerhouse of nutrients. “This humble fruit is extraordinarily rich in vitamin C, lycopene and antioxidants that are beneficial for skin. Guavas are also rich in manganese which helps the body to absorb other key nutrients from the food that we eat. Guavas benefits are credited due to the presence of folate, a mineral which helps promote fertility. The potassium in guavas helps normalise blood pressure levels as well. In fact, a banana and a guava contain almost the same amount of potassium. Since it contains about 80% of water it helps keep your skin hydrated”, says Dr. Manoj K. Ahuja, Sukhda Hospital. Benefits of guavas are aplenty and now we're going to talk about guava's nutritional value. A 100 gm serving of the fruit contains just 68 calories and 8.92 gm sugar, according to the data of United States Department of Agriculture (USDA). Guavas are also rich in calcium as they contain 18 gm of the mineral per 100 gm of the fruit. 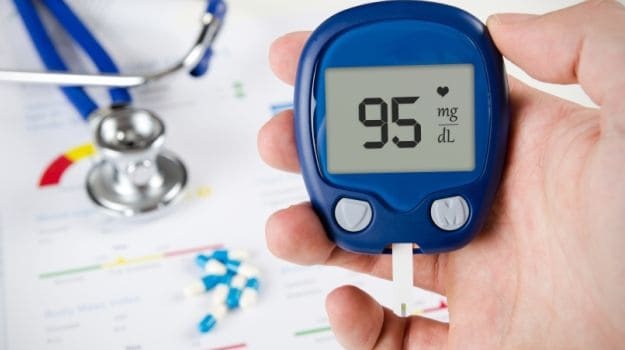 It also contains 22 gm of magnesium per 100 gm of the fruit, as well as significant amounts of phosphorus and potassium- 40 and 417 gm per 100 gm, respectively. Guava is termed to be a powerhouse of nutrients. Did you know: Guavas are one of the richest sources of vitamin C? It's true. Guava fruit contains 4 times the vitamin C content present in oranges. Vitamin C helps improve immunity and protects you against common infections and pathogens. Moreover, it keeps your eyes healthy. “Lycopene, quercetin, vitamin C and other polyphenols act as potent antioxidants which neutralise free radicals generated in the body, preventing the growth of cancer cells. 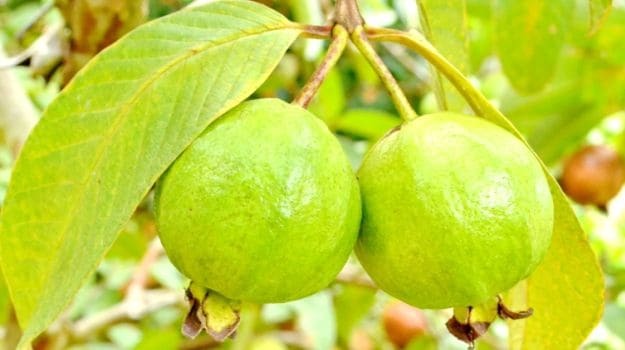 Guava fruit has shown to be widely successful in reducing prostate cancer risk and also inhibit the growth of breast cancer cells since it is rich in lycopene”, says Dr. Manoj K. Ahuja. Due to the rich fibre content and low glycaemic index, guavas prevent the development of diabetes. While the low glycemic index inhibits a sudden spike in sugar levels, the fibre content ensures the sugar levels are well regulated. Guava fruit helps improve the sodium and potassium balance of the body, thereby regulating blood pressure in patients with hypertension. Guavas also help lower the levels of triglycerides and bad cholesterol (LDL), which contribute to the development of heart disease. 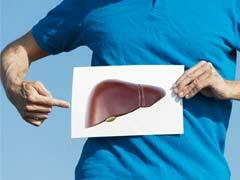 This magical fruit improves levels of the good cholesterol (HDL). It is one of the richest sources of dietary fiber in comparison to other fruits and just 1 guava fulfills about 12% of your daily recommended intake of fibre, which makes it extremely beneficial for your digestive health. Guava seeds, if ingested whole or chewed, serve as excellent laxatives too, helping the formation of healthy bowel movements. Due to the presence of Vitamin A, guava is well known as a booster for vision health. 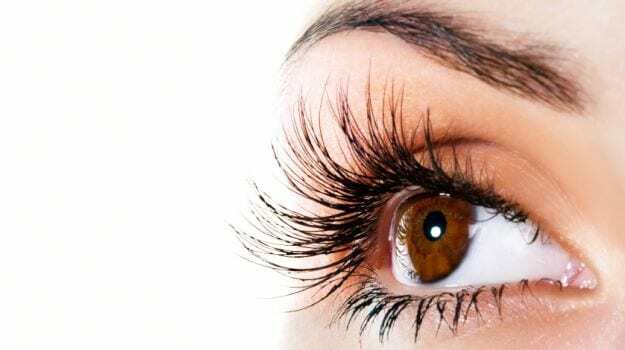 It can not only prevent degradation of eyesight, but even improve eyesight. 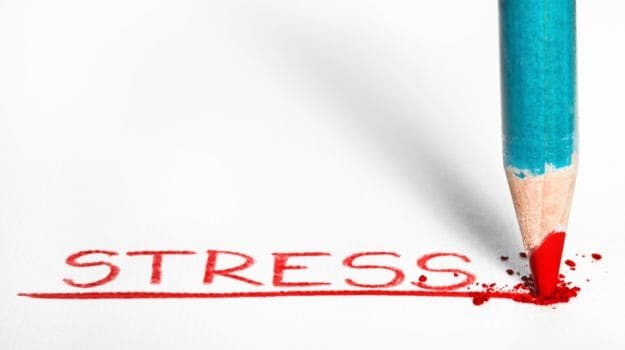 It can help slow down the appearance of cataracts and macular degeneration. Even though guavas are not as rich in Vitamin A as carrots, they are still a very good source of the nutrient. Guavas help slow down the appearance of cataracts and macular degeneration​. Guava's benefits pregnant women too as it contains folic acid, or vitamin B-9, which is recommended for pregnant women since it can help in developing the baby's nervous system and protect the newborn from neurological disorders. Guava leaves have a potent anti-inflammatory action and a powerful antibacterial ability which fights infection and kills germs. Thus, consuming guava leaves works as a fantastic home remedy for toothache. The juice of guava leaves has also been known to cure toothaches, swollen gums and oral ulcers. The magnesium present in the fruit is responsible for one of the many benefits of guava, helps to relax the muscles and nerves of the body. So after a hard workout or a long day at the office, a guava is certainly what you need to relax your muscles, combat stress and give your system a good energy boost. 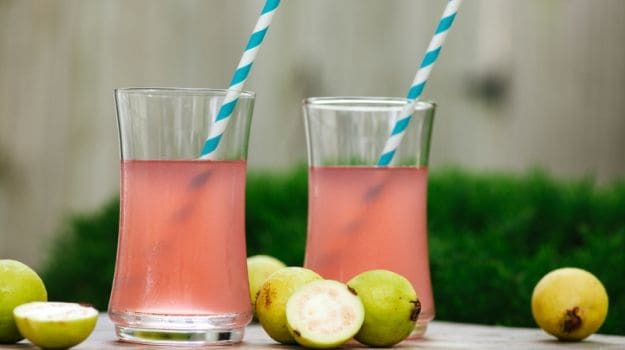 “Guavas contain vitamin B3 and vitamin B6, also known as niacin and pyridoxine respectively, which help in improving blood circulation to the brain, stimulating cognitive function and relaxing the nerves”, remarks Dr. Manoj K. Ahuja. Want to shed a few pounds? Guava is just the ticket. Without compromising your intake of proteins, vitamins and fiber, guava helps you lose weight by regulating your metabolism. It's a win-win! Guava makes for a very filling snack and satisfies the appetite very easily. Guava, especially raw guava, also has far less sugar as compared to apples, oranges, grapes, and other fruits. Guava has one of the highest quantities of vitamin-C and iron among fruits, and both are proven to be preventive against cold and viral infections. The juice of raw and immature guavas or a decoction of guava-leaves is very helpful in relieving cough and cold since it helps get rid of mucus and disinfects the respiratory tract, throat and lungs. Guava-leaves is very helpful in relieving cold and cough. Guavas are rich in vitamin A, vitamin C and antioxidants like carotene and lycopene which help protect the skin from wrinkles. A guava a day, keeps fine lines away! Guava helps regain the skin's radiance and freshness. Reap the benefits by preparing a DIY scrub at home: All you have to do is mash some guava flesh with an egg yolk and apply it on your face. Rinse off after 20 minutes with warm water. When used once or twice a week, this scrub will remove dead cells from your skin and lighten your complexion. Guavas are also a great source of Vitamin K, which helps get rid of skin discoloration, dark circles, redness and acne irritation. Guavas rank high in astringent properties, guava leaves and unripe guavas even higher. Guava helps tone up and tighten the facial muscles, so apply a decoction of the leaves and fruit on your skin and voila!